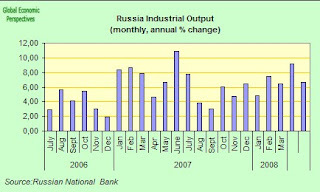 Russian industrial outpur rose at a slower pace in May id did in March, when output hit a nine-year high. Month on month oil companies produced less crude and exporters were constrained by the impact of a stronger ruble. The annual rate of inctrease fell to 6.7 percent from 9.2 percent in April, the Moscow-based Federal Statistics Service said today. Month on month production was down 1.9 percent on April. The ruble gained an inflation-adjusted 2.9 percent gain against a basket of currencies, making exports more expensive. Oil and gas condensate output fell by 1 percent on the month, while mining and quarrying rose by 0.1 percent, compared with 0.4 percent the previous month. Manufacturing increased an annual 10 percent in May, compared with 14.5 percent the previous month. Electricity, gas and water output increased an annual 2 percent in May, compared with 0.2 percent in the previous month. The construction sector grew 28.3 percent in the first quarter. Russia's economy expanded an annual 8.5 percent in the first quarter, higher than previously estimated, as consumer demand fueled a continuing investment boom. The expansion followed 9.5 percent growth in the previous three months, the Moscow-based Federal Statistics Service said today. Growth in, along with that in a number of other key emerging market economies is evidently far outpacing that in the United States, Japan and the euro region, and is at present one of the key drivers of global economic growth, not to mention oil and food prices. Russia's economy, which is boosted enormously by commodities exports - is largely being driven by wage growth, investment and consumer spending at the present time and this is raising questions about distrortions and sustainability in the longer term. The rapid expansion is also fuelling inflation, which accelerated to 15.1 percent in May, and may be a signal that the economy is overheating. Russian industrial output grew an annual 9.2 percent in April, the most in 9 months, as output of trucks, cars and construction materials surged. Real wage growth has advanced more than 12 percent every month this year, increasing demand for housing and consumer goods. The government expects the economy, the world's 10th biggest, to expand 7.6 percent this year after growing 8.1 percent in 2007. Demand from companies and consumers spurred import growth of 53 percent in the first quarter, compared with the same period in 2007, according to the Federal Customs Service. Russia's construction sector expanded 28.3 percent in the first quarter, the statistics service said, compared with 28.1 percent in the same period last year. Russian inflation accelerated to a faster rate than most economists expected in May -in the process achieving the fastest inflation in five and a half years. Russia's inflation rate rose to 15.1 percent from 14.3 percent in April, according to the Federal Statistics Service earlier today. 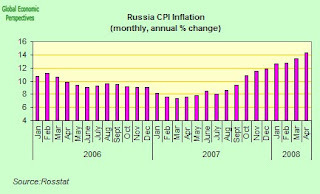 Russia is failing to bring inflation closer to the government target of 10.5 percent this year. Consumer-price growth quickened every month since September and has remained above target all this year. Many commentators are suggesting that the Russian government feel they can live with this rate because real wage growth remains very strong, but such a view is very dangerous. 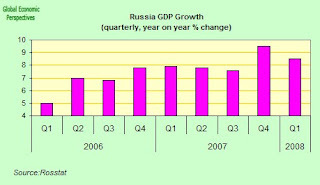 If Russian growth slows - or the price of oil drops suddenly - then we are going to see all sorts of problems here. Growth in Russian service industries from banking and telecommunications to restaurants accelerated in May while prices rose at the fastest rate since at least 2001. 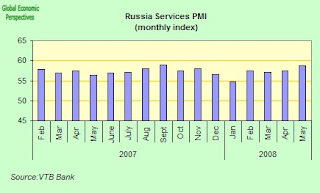 VTB Bank Europe's Purchasing Managers' Index for services rose to 58.7, the highest in eight months, from 57.5 in April. A reading above 50 shows expansion. Input prices rose the most since the index was created in October 2001. Russia, the world's biggest energy exporter, is in its 10th consecutive year of economic growth as record crude prices help stoke increases in wages and consumer spending. Retail sales rose an annual 13.2 percent in April and the inflation rate reached 14.3 percent, government figures showed. 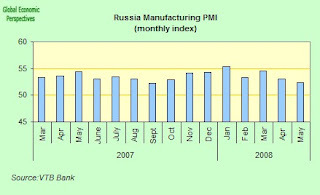 Russian manufacturing expanded in May at the slowest pace since last September amid accelerating inflation according to the VTB Bank Europe's Purchasing Managers' Index, which fell to 52.4 from 53 in April, the lowest since it reached 52.2 in September. A figure above 50 indicates growth, below 50 a contraction. The bank surveyed 300 purchasing executives. ``Growth in new orders and output weakened on the back of softening domestic demand, together with a sharper decline in export orders,'' Dmitry Fedotkin, an economist at VTB in Moscow, said in the statement. 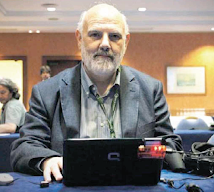 ``Inflationary pressures eased only marginally,'' he added. Imports account for an estimated 49 percent of the local retail market, highlighting the need to boost domestic production, former Prime Minister Viktor Zubkov said in April. 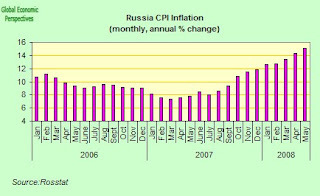 Russia is struggling to slow inflation to 10 percent this year as food and energy prices rise. The rate rose to 14.3 percent in April, the highest since in five years. The IMF warned today that Russian inflation may accelerate to 14 percent this year and that the risk of the economy overheating is mounting. Consumer prices rose an annual 14.3 percent in April, a five- year high, stoked by global food price increases and rising domestic wages. The economy grew 8 percent in the first quarter, the Economy Ministry said in a preliminary estimate on April 17. Gross domestic product rose 8.1 percent for all of 2007. Russia, the world's second-largest oil supplier, produced 0.8 percent less crude in May than in the same month last year, bringing the country closer to the first annual drop in oil output in a decade. Exports also fell. Production slid to 9.74 million barrels a day (41.2 million metric tons a month) from 9.82 million barrels a day a year earlier, according to data released today by CDU TEK, the Energy Ministry's dispatch center. Output rose 0.2 percent from April. Total exports fell to 5.52 million barrels a day, 4.6 percent less than in May last year and 1.6 percent less than in April this year. Exports through OAO Transneft, the state oil-pipeline operator, fell 2.4 percent from a year earlier and 1.3 percent from a month ago to 4.46 million barrels a day. Production declines continued at OAO Lukoil, Russia's largest independent producer, and Exxon Mobil Corp.'s Sakhalin-1 project. BP Plc's Russian venture TNK-BP, OAO Surgutneftegaz and state- controlled OAO Gazprom Neft boosted output compared with April, while failing to pump the same amount as last year. Russian offshore production has faltered this year after compensating last year for a drop at onshore fields. Sakhalin-1 pumped 217,100 barrels a day in May, 13 percent less than last year and 2.2 percent less than a month ago. Lukoil produced 1.77 million barrels a day, down 3 percent from last year, which may threaten to undermine its plan to boost output 1.5 percent this year. State-run OAO Rosneft, which boosted output by about a third after buying bankrupt OAO Yukos Oil Co.'s assets last year, produced 2.27 million barrels of oil, 0.6 percent less than in April.